With our daughter away at camp this week, I thought there would be lots of extra time for date nights with the Hubs and to get caught up on all the things on my to do list. Somehow the week flew by and I'm no further ahead than I was before. Just like on Mother's Day, on Father's Day, we had to get up at 5:30 am and go to a swim meet. We were planning on having a nice Father's Day lunch and then dropping our daughter at camp but we were all so tired we came home and took naps before heading to camp. 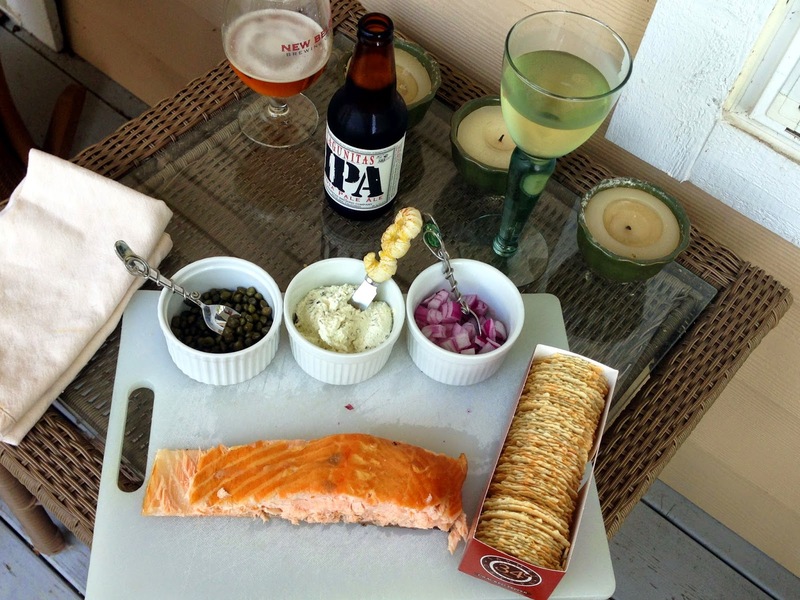 When we returned home, the Hubs and I sat on the front porch and had a glass of white wine and some smoked salmon. It was a nice way to end the day. 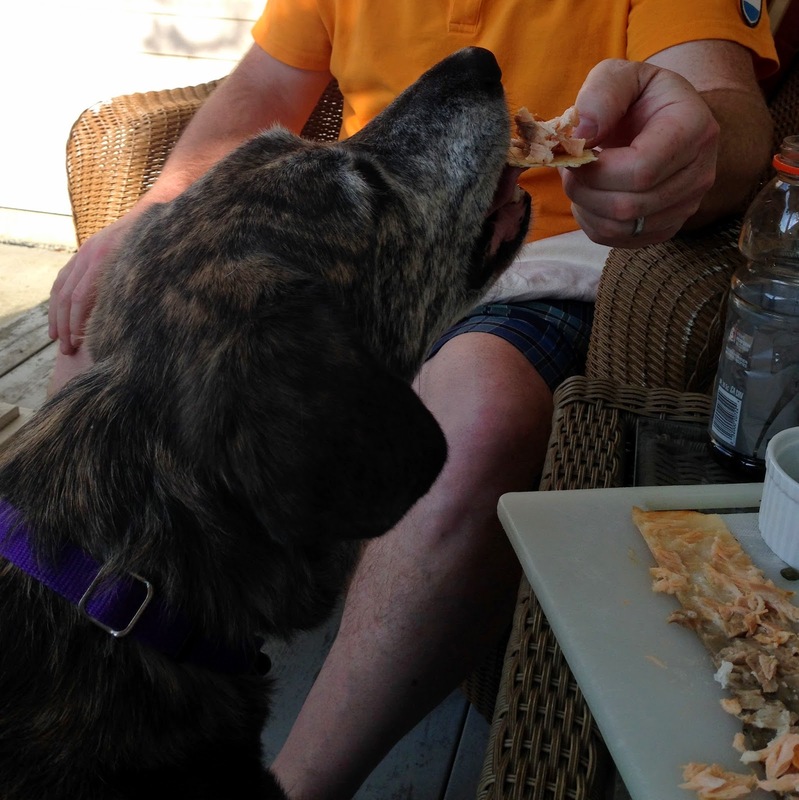 Even the pooch enjoyed a little taste when we were finished. Pretty in Pink today. I was doing a Target run and ran into one of my colleagues from the Swim Club board wearing this same outfit. Great minds think alike! 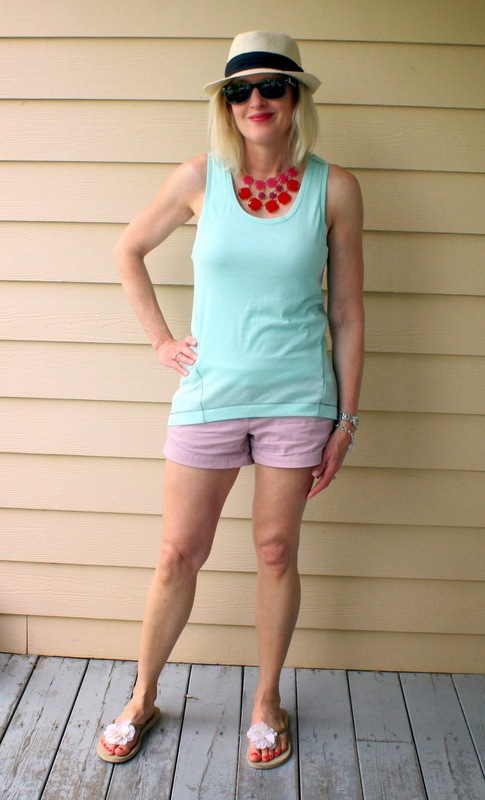 I created this outfit based on a Piperlime promo email I received that morning showing white eyelet shorts and a blue striped oxford top as a summer must have. 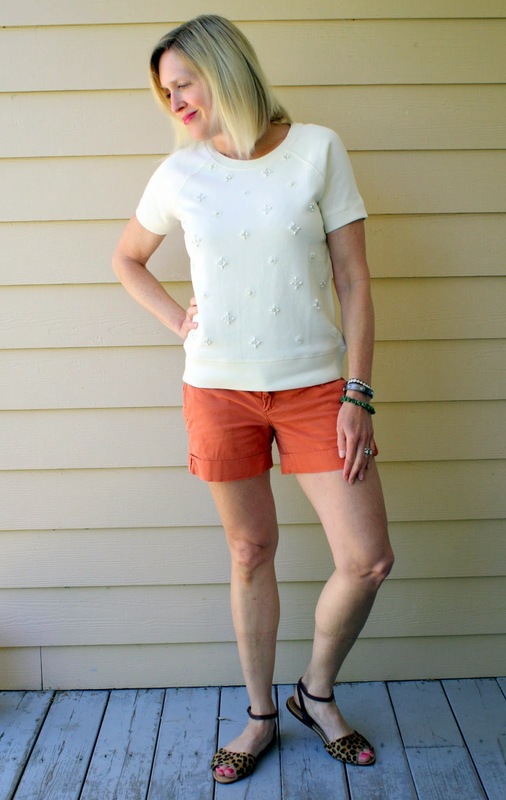 See my post on how to style eyelet shorts three ways here. 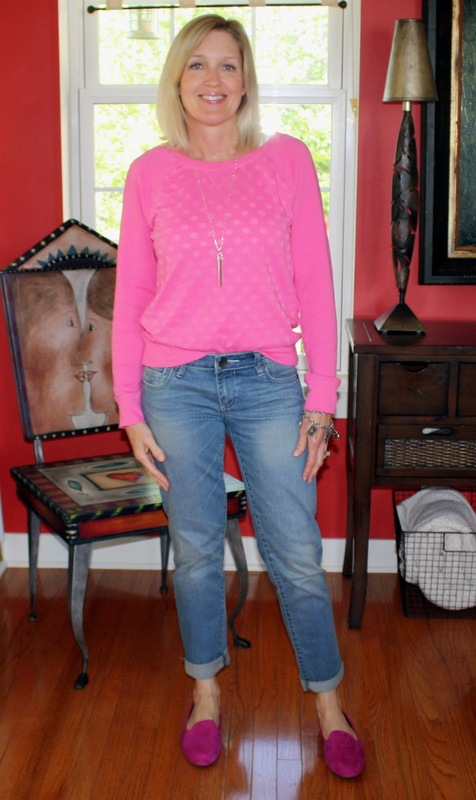 I usually wear a chambray shirt under this embellished sweatshirt in the winter. It was the perfect neutral top to pair with the orange shorts. I added the leopard sandals to pull the look together. Shades of Blue. This is actually a maxi dress. I added the tank for a more casual look and paired it a gold necklace to add some bling. Thanks for reading! If you want to see more everyday style, I'd love it if you followed me on Bloglovin or Google+! Yay, love your outfit updates! Every single one looks great. I have been eyeing that Old Navy striped pullover for awhile. I've seen it in blue stripes but didn't know they had pink. Now I want both! ha ha. You're beautiful. Love the shorts. Thank you so much Nell! Glad you stopped by! I LOVE all of your outfits in this post. So pulled together! I have the same shirt as outfit # 3, but in yellow, and I love it. Have a great weekend! Love all of these looks! I could definitely steal that pink and white striped shirt! It's so adorable! I love the pink and white striped shirt! Happy Friday! I know what you mean about when you have time to do more things you never get any farther ahead! :) Love your beautiful summer outfits! 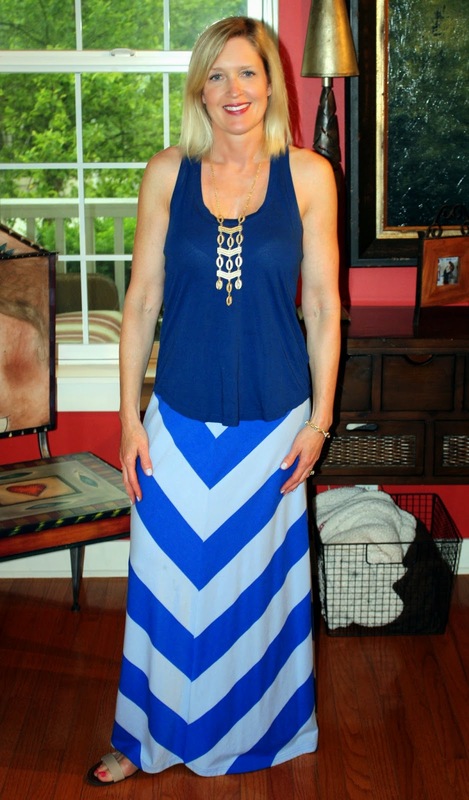 Your maxi dress is beautiful layered with your tank! Your wine and salmon looks great! How does it always seem to happen that even when you think there will be more time, it always gets filled?! Love all your outfits but especially the white shorts with the pink and white striped shirt. Hope you had a great weekend! The look with the pink sweatshirt is my favorite - so simple, but you look so pulled together and cute! All of your outfits are great, but I especially love the maxi dress turned skirt! So creative! I desperately want some little lace shorts! So sweet. 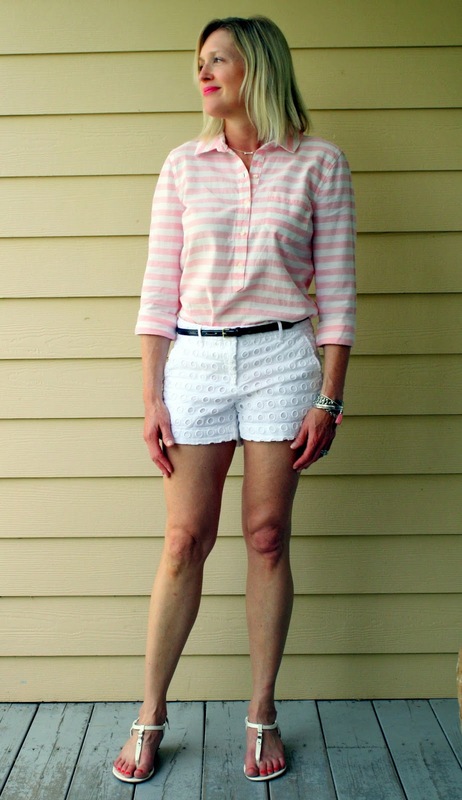 I so adore those eyelet shorts with the pink striped shirt! Really great look. I love the eyelet shorts too! That is my favorite look. I have a pair in red and navy and have to keep myself from over-wearing them! We had a kid-free weekend and it felt like a blip! Nice but so fast! Love that last ensemble...so nautically perfect! Love your everyday style. So casual and cute! Thank you for stopping by my post and living a comment.